A Savannah Golf Club Wedding is a true Southern affair. The Savannah Golf Club has an extensive history that dates back to 1794 and it is on record as being the oldest golf club in the United States. The club is also located in what is thought to be the first American city to have the game of golf played in it. The city of Savannah, Georgia is the oldest city in the state and is known for being the largest, historically restored urban area in the county. It is a city that has adapted to the modern world, but still retains its old Southern charm. This picture from a Savannah Golf Club Wedding shows the groom and his groomsmen on a rented trolley as they make their way to the wedding ceremony. The trolley has an antique appearance, though it has been updated. The interior of the car in primarily covered in smooth wood panelling and the seats are refurbished wooden benches. Each detail in the trolley car works to take the men within it back in time. This wedding party is a large one, with the 11 groomsmen seen occupying the benches. In this image, the groom is seated at the back of the trolley, the center of the photo. 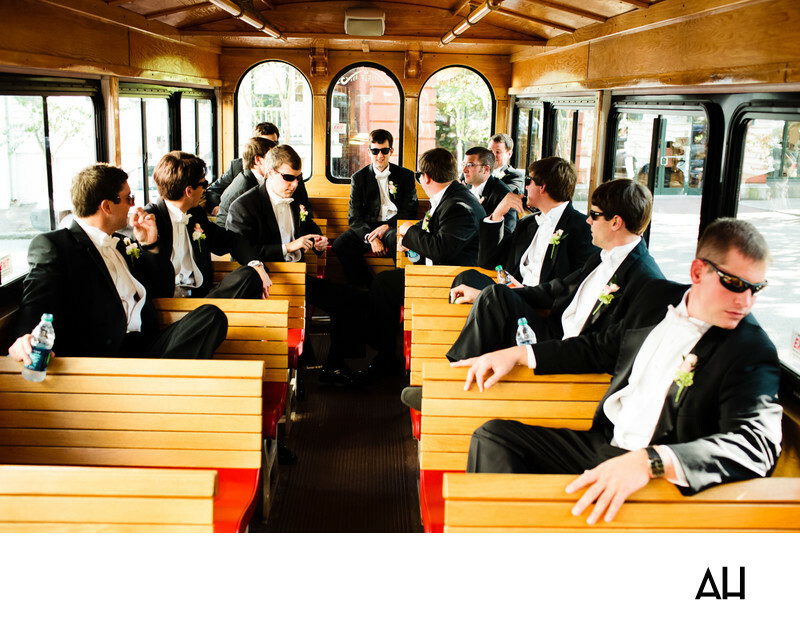 The groomsmen surround him on either side of the car aisle, chatting and taking in the sights of the city as the the trolley rolls down the historic Savannah streets. The groom and his groomsmen look dapper in their white and black tuxedos. Their outfits consist of jet black pants and jackets, combined with snow white dress shirts, vests, and bow ties. They make a handsome group of gentlemen, and their attire gives the air that they are traveling to an old Southern ball, like something out of Gone With the Wind. It will truly be a day to remember.